Note: PDF files require Adobe® Reader®. To download the latest free version, click the Get Adobe® Reader® button below. LECANTO, FL -- Withlacoochee Regional Water Supply Authorityºs Board of Directors representing Citrus, Hernando, Marion, and Sumter counties adopted Resolution 18-03 declaring April 2018 as "Springs Protection Awareness Month." There are five (5) firstmagnitude spring groups within the Withlacoochee Regional Water Supply Authority (WRWSA) region that collectively discharge more than one billion gallons of water each day. The Authorityºs intent is to focus the publicºs attention on protecting, maintaining and restoring where necessary the natural springs within the region. These springs are essential to the environment, economy, citizens and visitors of the region. By adopting the Springs Protection Awareness Month Resolution, the Authority is demonstrating its commitment to environmental stewardship, including efforts to conserve and restore the ecological balance of these spring systems. LECANTO, FL -- Withlacoochee Regional Water Supply Authorityºs Board of Directors representing Citrus, Hernando, Marion, and Sumter counties adopted Resolution 18-02 declaring April 2018 as "Water Conservation Month." The Authorityºs intent is to focus the publicºs attention on the need for and benefits of water conservation, and to highlight the resources available to help the public conserve water. Since 1998, the state of Florida, water management districts, cities, counties and water-related organizations, such as the Florida Section of the American Water Works Association, have declared April as "Water Conservation Month." April is typically the time of year when water demands increase due to generally hot and dry conditions. The Authority urges every consumer and each citizen and business to become more aware of the need to save water, and to take appropriate measures to conserve and protect this vital natural resource by practicing water saving measures. View additional information about watering restrictions applicable to your area. The Withlacoochee Regional Water Supply Authority (WRWSA) announces a public meeting to which all persons are invited. The WRWSA Professional Services Evaluation Committee (PSEC) to review Consultant Statements of Qualifications for the Regional Water Supply Plan Update. The WRWSA has requested "Statements of Qualifications" (SOQ) from consultants interested in providing professional engineering services to complete the project known as the "Regional Water Supply Plan Update." A PSEC has been established to review and evaluate SOQ submittals and make recommendations on professional services selection. LECANTO, FL -- Withlacoochee Regional Water Supply Authoritys Board of Directors representing Citrus, Hernando, Marion, and Sumter counties began the new year by electing a slate of new officers: Hernando County Commissioner Nick Nicholson, serving as Chairman; Marion County Commissioner Michelle Stone serving as Vice-Chairwoman; and Sumter County Commissioner Steve Printz serving as Treasurer. The Authority officially recognized former Citrus County Commissioner Dennis Damato for his outstanding service during his tenure from 2005 through 2016. Mr. Damato served as the Authoritys chairman for four terms, during an important period of time when the Authority was working to update the Charles A. Black Wellfield Contract for Water Supply. During his tenure, Commissioner Damato also led the Authority through a variety of critical projects to the benefit of the entire four-county Withlacoochee region, including joint funding of water conservation grants for member governments; implementation of the Phase II of the Regional Outdoor Irrigation Audit pilot program; coordination for the Southwest Florida Water Management Districts 2015 regional water supply plan; advocacy on behalf of the Authority and member governments on such issues as water use permitting, springs protection, the establishment of minimum flows and levels (MFLs); and influencing statewide comprehensive water policy legislation. The next Authority Board of Directors meeting will be on March 15th at 3:30 pm at the Lecanto Government Building, Room 166, 3600 W. Sovereign Path, Lecanto, Florida 34461. LECANTO, FL -- Withlacoochee Regional Water Supply Authorityas Board of Directors representing Citrus, Hernando, Marion, and Sumter counties began the new year by electing new officers. Beginning February 17th, Citrus County Commissioner Dennis Damato will serve as Chairman, Hernando County Commissioner Nick Nicholson will serve as Vice-Chairman, and Marion County Commissioner Earl Arnett will serve as Treasurer for the Authority. This past year, Sumter County Commissioner Al Butler served as Authority Chairman from January 21, 2015 through February 16, 2016, during an important period of time when the Authority has been working to update the Charles A. Black Wellfield Contract for Water Supply. The next Authority Board of Directors meeting will be on February 17th at 3:30 p.m. at the Lecanto Government Building, Room 166, 3600 W. Sovereign Path, Lecanto, Florida 34461. LECANTO, FL -- Withlacoochee Regional Water Supply Authoritys (WRWSA) Board of Directors representing Citrus, Hernando, Marion and Sumter counties expressed support for approval and implementation of the Rainbow River Surface Water Improvement and Management (SWIM) Plan, by adopting a resolution. The plan was developed by the Southwest Florida Water Management District, in cooperation with local, regional, state agencies and various stakeholders. The effort was led by the Springs Coast Steering Committee, with support from Management and Technical committees. The WRWSA participated on the Management Committee. A unique treasure, the Rainbow River is a first-magnitude spring system that contributes to the regions aesthetic, ecological, and economic health. Issues, strategies, and priorities needed to protect and restore the Rainbow River are identified in the plan. Successful implementation of the plan requires support at all levels of government and private stakeholders. A copy of the resolution may be found at the Authoritys website: www.wrwsa.org. The next Authority Board of Directors meeting will be held on January 20, 2016 at 3:30 pm at the Lecanto Government Building, Room 166, 3600 W. Sovereign Path, Lecanto, Florida 34461. LECANTO, FL -- The Withlacoochee Regional Water Supply Authoritys Board of Directors representing Citrus, Hernando, Marion and Sumter counties adopted its 2015-16 budget, representing reduced costs and enhanced efficiencies for member governments. The Authoritys per capita assessment has remained $0.19 for the past five years, while overall expenditures for the coming year will be 19.9% less. Notably, the Authoritys administrative budget is reduced by 1.9% from the current year owing to a diligent effort to hold the line and reduce, where possible, all administrative expenses. This is the fourth consecutive year that the Authority has successfully reduced its Administrative budget. The water resource development projects budget will be 31.3% less than the current year, reflecting completion of several key projects. Projects included in the coming years budget continue the Authoritys highly successful, on-going regional outdoor irrigation program conducted in partnership with the Southwest Florida Water Management District and Authority member governments. In addition, the Authoritys Local Government Water Conservation Grants are funded at the current years funding level of $130,000, with grant proposals due by the end of June and will be presented to the Board in September. The grant program is intended to fund water conservation-related projects on a matching basis. Applications and instructions are found on the Authoritys website here: Grant Program Information. Water conservation continues to be the most cost-effective way to stretch limited fresh ground water supplies in order to meet the regions growing demand. 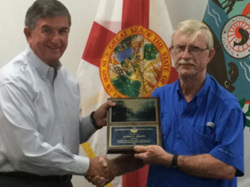 LECANTO, FL -- Withlacoochee Regional Water Supply Authority representing Citrus, Hernando, Marion and Sumter counties honored immediate past chairman, Hernando County Commissioner Jim Adkins for his outstanding achievements during his tenure. Notably, under Mr. Adkins leadership, the Authority has significantly reduced water supply demand in the four-county region through water conservation by implementing a most successful outdoor irrigation program in partnership with its member governments and the Southwest Florida Water Management District (SWFWMD). The March 19th meeting of the WRWSA Board of Directors has been CANCELLED. The WITHLACOOCHEE REGIONAL WATER SUPPLY AUTHORITY announces a public meeting to which all persons are invited. In lieu of the Board meeting, a tour of Tampa Bay Waters seawater desalination facilities has been scheduled for WRWSA Board members starting at 1:30 p.m. on March 19, 2014. Members of the public interested in attending this tour should notify the WRWSA by email to lstout@wrwsa.org or call 352-527-5795. Attendees will meet at the desalination facilities located at 13041 Wyandotte Rd., Gibsonton, FL 33534.